Development & Communication : Personality Development & Public Speaking Workshop on 13th Anniversary Celebration! 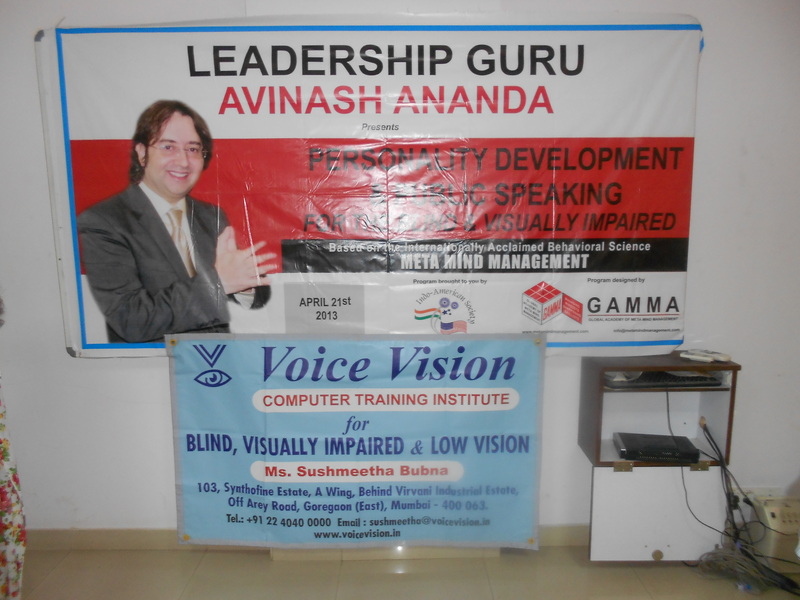 Voice Vision, in association with the Indo American Society, organized a one of its kind workshop on Personality Development & Public Speaking designed for the visually impaired on Sunday, April 21, 2013 at H. K. Institute of Management studies, Jogeshwari. “Personality, Presentation, and Public Speaking are key skills in today’s dynamic world. Keeping with this thought Voice Vision provided a platform for the visually impaired audience to learn some skills which are often neglected, but are of utmost importance in one’s social presence, such as shaping one’s communication skills, tips to improve one’s confidence and helping one tune his/her content for a public address and much more.” said Sushmeetha Bubna, founder of Voice Vision. Titled “Development & Communication” the workshop was held on Voice Vision’s 13th anniversary. The event was flagged off with the warm welcome by the anchors Ms. Neema & Ms. Malvika. This was followed by a presentation made by Mrs. Brinda Upadhya, a Social Worker, where she highlighted the organization’s activities and achievements of the past year. The presentation was followed by the declaration of the Voice Vision scholarship 2012 – 2013. Ms. Sushmeetha B. Bubna, founder Director of Voice Vision; Ms. Upasana Saraf, a trained clinical psychologist and Mrs. Brinda Upadhya, retired lecturer & social worker constituted the judging panel. The scholarship award of Rs. 5000/-, Scholarship certificate and a computer training course at Voice Vision, was awarded to Ms. Suman Rajbhar for her exemplary academic and non-academic performance by Mrs. and Mr. Chaudhari. Suman spoke how important this scholarship was for her and how it will help her in her education. This was followed by the personality development & public speaking workshop. The day-long workshop comprised a blend of highly interactive discussions and introspection pit stops The workshop commenced at 10 AM and went on till 5:30 PM. It gave the visually impaired people an overview of good & effective communication. Some interesting aspects that were covered by Mr. Avinash Ananta were: how one should modulate pitch & volume accordance to the situation & importance of modulation, non-verbal communication like Listening, Gesture, Posture, Voice. While communicating to a large audience one should take care of few points such as being different, maintain proper speed, consider the topic of interest with regards to relevance of topic, should add emotions to the speech was demonstrated using various case studies. The inevitable aspect of life “Change” was brought up by Ms. Varsha, with affirmation sentences to oneself, how one can accept and bring change was demonstrated using the technique of PRAYER “Positive Repetitive Affirmative Yielding Excellent Result.” Keeping cool & calm in adverse situation & instead of reacting to situation, the technique of responding was shown. The Indo American Society & GAMA team of trainers and volunteers made special modifications to accommodate practical demonstration wherever necessary for optimum understanding of the techniques by the visually impaired. They also focused on giving individual attention to every participant, thereby making their experience of learning, more value-driven. The workshop ended with each group talking about their learning from the day. The day closed with distribution of certificates & vote of thanks by Ms. Sushmeetha B. Bubna. Voice Vision would like to express heartfelt gratitude to all the speakers of the workshop for conducting an excellent session and educating participants about personality development. Special thanks to Colonel Ravindra Joshi, who understood the sensitivity of the requirements by the young participants. We also thank Prof. Krishana Pandey – Director and Prof. Aftab from H.K. Institute Of Management Studies & Research, for lending us their premises, for the workshop. We would like to express our gratitude to all of the corporate & individual volunteers including the students from Thakur College of Science & Commerce, Kandivali & volunteers from Ascent Networks Pvt. Ltd, for their prompt services. Lastly would thank all the participants for believing in us & taking full efforts to make for the event. Who came from different cities & states as Surat, Pune, Ghatkopar, Nalasopara etc.